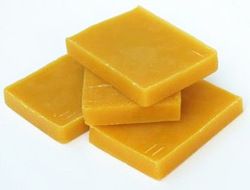 Prominent & Leading Manufacturer from Bengaluru, we offer beeswax. Beeswax is produced when honeybees consume honey. It takes about 8-1/2 lbs. of honey to produce one pound of beeswax. Beeswax is great lubricant for oiling furniture joints. It is also good for smooth movement of doors and windows. Beeswax is a regular component for moustache creams. You can polish your granite counter tops regularly with molten beeswax to keep them shiny bright! Just apply the beeswax, allow it to dry up and then wipe it off with a suede piece of cloth. In archery, bow strings are bees waxed both in order to reduce friction as well as to protect the string from damage due to dirt. To waterproof leather boots & gloves, rub beeswax on to outerwear. Baking pans are coated with beeswax for a natural non-stick surface. Beeswax is used to coat the sewing thread to strengthen it and to give it a smooth coating so that it is less likely to catch or snag material while sewing. Beeswax has a melting point between 146 and 149 degrees Fahrenheit. Burning of beeswax candles produces a white rounded flame, giving a wonderful warm glow. Beeswax is great for woodworking, bow hunting, camping, crafting, lubrication, sewing, artistic moulds, candles, and more. Beeswax is one of the most versatile products in the natural world. From candles to cooking, beeswax has a use in every part of your home. Great for salves, creams, crafts, lotions, soaps, and more. See additional description below for more uses of beeswax. NATURAL COLOR, BEESWAX UNALTERED NO ADDTIIVES 100% Pure and Natural Beeswax. Uses of Beeswax: Moisturizing cream Soap making Fruit coating Baking-sheet coating Lipstic/cosmetics Sealing on jams and jellies encaustic painting Dipped candles Molded candles Beard wax Grafting wax Crayons Carving objects Tack cloth Wood filler Polishes Nail/screw lubricant Leather waterproofing Thread and fishing line coating Lubricants: zippers, windows, drawer slides, etc. Looking for Honey Beeswax ?